Cardston, Alberta – American Creek Resources Ltd. is pleased to report the commencement of a significant drill program on the Treaty Creek Project, immediately adjacent to and in the same hydrothermal system as Seabridge Gold’s KSM property (largest gold deposit in the world by reserves) and Pretium’s high-grade Brucejack mine. Treaty Creek has similar geophysical, geological, and structural signatures to its neighbours with potential for similar scale. Geophysical anomalies on Treaty Creek. Courtesy of American Creek. The 2016 Magnetotelluric geophysical survey program was effectively utilized as a guide for the drill program. The MT Survey suggests that the mineralization continues to the southwest, toward the Iron Cap deposit of Seabridge Gold Inc. 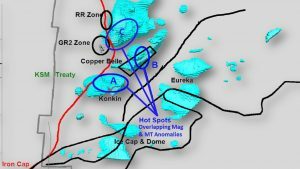 The MT Survey also suggests that the mineralized zone is open along strike and to depth.